When you have decided to order quality building insulation services for your structure, it’s important to choose a crew that has the experience and training to avoid the numerous mistakes in the industry that can prove to be costly and dangerous. AZ Drywall Finishing is proud to provide the top insulation contractors in Chicago, delivering quality and pride with every action. 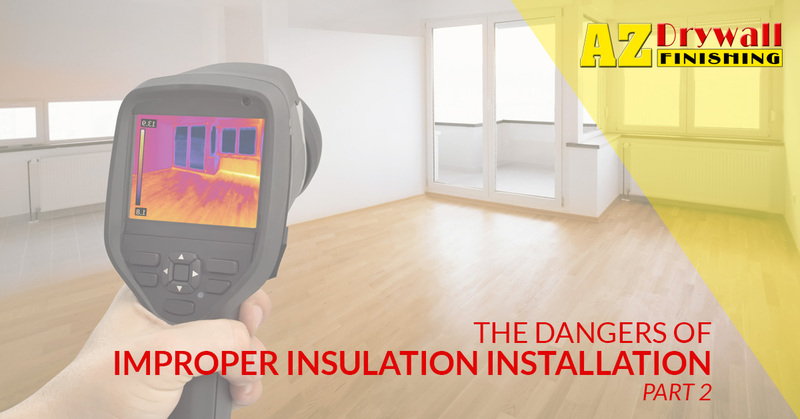 Today, we’ll continue our look into the dangers of receiving improper services from one of the many inexperienced insulation companies in the industry. Installing insulation may seem like a straightforward service, yet the risks of doing it improperly make the entire process a perfection-first task. When you’re in need of unbeatable insulation services, remember to reach out to AZ Drywall Finishing for assistance! Your home’s insulation relies on a delicate balance of keeping air trapped in the house along with allowing proper ventilation procedures to occur. With too much ventilation, your home’s ability to protect against extreme temperatures will be compromised in addition to moisture complications. This is typically due to minimal insulation for walls and attic space, where poor coverage creates an open area for heat transference. When too little ventilation exists, the potential for hot or cold spots becomes prevalent. Ice buildup and fire hazards are risks that you do not want in your building! Beyond the risks to your home, you as the DIYer can also come under fire if the proper precautions are not taken. Fiberglass insulation contains metal particles and small bits of recycled glass, creating a major irritation when skin contact occurs. When introduced to the eye, complications can range from blurriness to full vision loss. Additionally, the risk to your lungs can be a major issue if the best precautions are not followed. It’s essential to find experienced insulation contractors to get the job done right to avoid any airborne dangers, both during installation and daily operations. The purpose of insulating your business is to retain comfort while saving on energy costs. When the job isn’t done effectively, the long-term consequences can be very costly. Most property owners benefit from the cost-saving effects of insulation, saving a lot of money over time. If you pay for building insulation that fails to do its job, then you are burning money at both ends! The key to successful insulation and drywall services is to create the perfect product on time, the first time. Business owners and property managers hoping to save on the costs may take matters into their own hands, providing personal personnel or hiring a cut-rate insulation company. If everything is done correctly, you will enjoy years upon years of comfort and energy efficiency. When the install process is done incorrectly, numerous risks are created that can affect both the structure and its inhabitants. Paying for an improper project is bad enough, but paying for costly repairs is even worse! Be sure to get the job done right with AZ Drywall Finishing! Our insulation contractors in Chicago are proud to have provided the best commercial wall services to Illinois since 1999. By focusing on quality and precision, our experts are able to deliver timely results that exceed your expectations while retaining a top-notch safety record. Contact us today for a quote on your upcoming project or to learn more!